Experience the outstanding benefits of our antioxidant cocktail! Ferulic acid, when formulated with Vitamin C (L-ascorbic acid) has taken the skin care industry by storm! Cutting edge ingredients, like naturally derived Asafedtida & Sugar Apple extracts, Resveratrol (an anti-aging antioxidant found in red wine and cocoa), Malic acid, (an ultra gentle exfoliate) and other botanical actives, are the basis of our revitalizing serum. Our ferulic serum+VitC is formulated with a whopping 20% of Vitamin C. Ideally suited for those who experience the visible signs of cumulative sun exposure and pre-mature aging. Once absorbed, Ferulic acid cannot be washed off and will stay active on the skin for 2-3 days. The pH level at 3.2 makes this suitable for even sensitive skin. This day serum delivers real, visible results. *20% L-ascorbic acid~ A highly stable and potent form of Vitamin C, renowned for its antioxidant benefits. Effectively protects against environmental stressors, helps fade dark spots, visibly smooths fine lines and brightens skin tone. * Ferulic acid is a plant-derived antioxidant, responsible for neutralizing free radicals. Ferulic acid naturally enhances the potency of Vitamin C.
Naturally derived Sugar Apple Tree and Asafetida extracts promote cellular interaction and collagen synthesis. Daucus Carota Sativa (Carrot Root) and Vitis Vinifera (grape skin) extracts defend skin against free radicals and are antioxidant rich. Note- our formula has a light, pleasant and delicate scent. It is the nature of the ingredients. How to use: Use in the morning and apply 3-4 drops of Serum to cleansed face, neck and chest area, even the back of your hands! Massage well into your skin. Allow the serum to dry and follow with a fragrance free moisturizer. May also be used as a booster under a facial mask. (allow Serum to dry before applying facial mask). Avoid eye area. Do not store this product in direct sunlight or extreme temperatures. The serum is packaged in a dark, glass bottle to protect the serum from light and air. Step 2: Apply Serum by "dropping" 3-4 drops to forehead and cheeks. Massage into the face and neck and decolletage, until you feel the Serum drying. Be generous with your drops, as a quality Serum has been shown to penetrate deeply into the skin. Step 3: You can layer treatments. If you want to add another Serum or treatment, then apply it in this step. Follow all Serum/treatments with a Moisturizer appropriate for your skin. 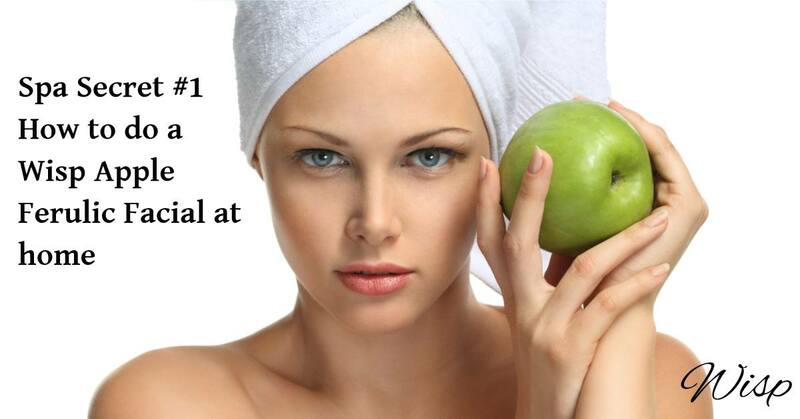 TIP: Scroll down to see how to benefit from our Amazing Age Defying Apple Ferulic Facial Mask! Serums are a concentrated delivery system with specialized ingredients. They may target specific skin issues or contribute to skin health and a glowing complexion. Typically in a light lotion or gel like base, Serums are lightweight, thin and glide easily on your skin. A Serum is applied to a clean face and followed by a moisturizer. Ingredients: Aqua (purified water), L-Ascorbic Acid (Vitamin C), Xanthan Gum, Silica, Cellulose Gum, Vegetable Glycerin, Sodium Ascorbyl Phosphate, Ferulic Acid, Resveratrol, Glyceryl Undecylenate (and) Glyceryl Caprylate, Annosa Squamosa (Sugar Apple Tree) Seed Extract, Asafetida Extract, Malic Acid, Salicylic Acid, Gluconolactone, Daucus Carota Sativa (Carrot) Root Extract, Vitis Vinifera (Grape Skin) Extract, Alteromonas Ferment Extract (and) Chrysanthellum Indicum Extract, Cholorophyll. Targeted to~ Tight skin that appears rough, dehydrated &/or flaky. Appearance of fine line/wrinkles, loss of firmness and glow. Designed to hydrate, brighten and clarify skin. The emphasis is on apple pomace (DNA/RNA), ferulic and Vitamin C. The exfoliating treatment has high levels of Vitamin C and ferulic acid that provides the skin with 2-4 days of antioxidant protection. Pour yourself an Apple Martini and let's get started! Remove makeup, cleanse the face, neck & decollete with the appropriate detergent free/fragrance free cleanser for your skin (Calming milk cleanser or botanical facial cleanse). Gently remove cleanser with warm cloth or rinse with lukewarm water. Do not rub your face. Dab your face dry with a soft, clean cloth. Once cleansed, lightly spray your face with our tamarind seed-marine mineral facial mist. Allow skin to dry completely before proceeding to next step. Apply a thin layer of our DNA/RNA apple antioxidant mask over the face and neck with a fan brush.You may experience a warmth, then cooling and finally a "tightening". Leave mask on for 10-15 minutes. (We do not recommend leaving the mask on for longer). Once the mask has completely dried, gently remove with a warm cloth or rinse well with lukewarm water. Apply 3 drops of complex peptide serum to forehead, cheeks, chin and neck. Massage until absorbed. Using fingertips, gently apply eye treatment/moisturizer around eye zone. Tip: Your face may be extra sensitive after the facial, so take care not to rub your skin roughly. NO Parabens, Sulfates (SLS), EDTA ,Artificial Colorants(dyes), Artificial Fragrance, Essential oils, Mineral oil, drying alcohols, Formaldehyde, Hydroquinone, Retinal Palmitate, Oxybenzone, Mercury, BPA, BHT, Eugenol, Animal Oils, Mineral Oil, Methylisothiazolinone and Methylchloroisothiazolinone , Triclocarban, Thimerosal. Began using the ferulic serum along with the Complex Peptide Serum & Tamarind Facial Creme 2 weeks ago. I cannot believe the difference in my 68 year face .... my skin is so smooth and the overall tone is better. Each of the products absorb quickly which is super for a morning routine. Unlike other facial creme I have used the Tamarind disappears leaving no sticky feel or shiny residue. I do not always want to apply a light foundation so even without one my face has a natural healthy glow. I've been devoted to popular expensive brands all my life ..... but now that I've found Wisp I'm honestly converted & I love the price !